Our Hydrographic Solutions team works closely with port stakeholders to ensure all navigable areas are surveyed, charted and maintained to their declared depths. 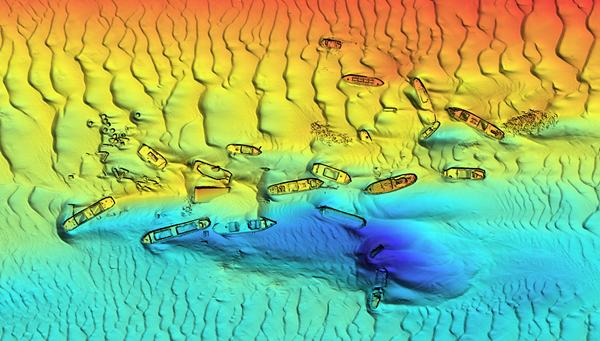 It is one of Australia’s largest and most experienced hydrographic surveying teams, with more than 150 collective years’ industry experience. The team includes both Certified Professionals in Hydrographic Surveying (Level 1) and IHO-FIG-ICA Category 'A' accredited Hydrographers. All work is undertaken in accordance with local and international guidelines and standards. Every year, we conduct approximately 800 hydrographic surveys within the port and its approaches, as well as commercial surveying services for local governments, port authorities and infrastructure projects all along Australia’s east coast. Our team also provides natural disaster recovery support, helping port authorities to obtain a picture of damage to marine infrastructure and prioritise recovery plans to help re-open the port or facility as quickly and safely as possible. Hydrographic Solutions has recently delivered surveying services for Department of State Development, Redland City Council, Moreton Bay Regional Council and North Queensland Bulk Ports.